P.C. Bob Newham and his dog Razor (pictured above) ranked overall fourth place in the 50th Anniversary National Police Dog Trials, on Sunday, May 9th, at Lincolnshire Police Headquarters. The three-day competition put the country’s experienced police dog handlers and dogs through their paces. 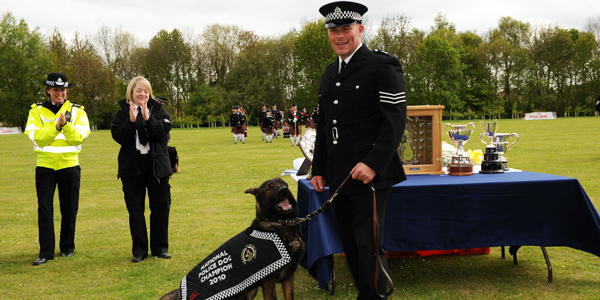 The overall National Police Dog Trials Winner for 2010 is Sergeant Simon Young of Central Scotland Police and his dog Ralph. Young had to travel back to Scotland during the three-day competition, as his wife was imminently due to give birth to their second child. Young and Ralph achieved a total score of 807 out of 1000. The 50th National Police Dog Trials Winner is Sergeant Simon Young of Central Scotland Police and his dog Ralph. The second spot the competition was taken by Sergeant Paul Glennon and his dog Spud, from Devon and Cornwall Police, and third by P.C. Stephen Ritchie and his dog Amstel, from Tayside Police. Barry Turner: What colour will the English passport be?